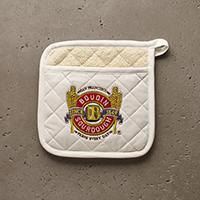 Boudin logo quilted white potholder with heavyweight 100% cotton twill on the outside and thick protective cotton terry inside. From Tom Freel of Astoria, Oregon on 2/16/2018 . From Anonymous of Portland, Oregon on 12/23/2017 .